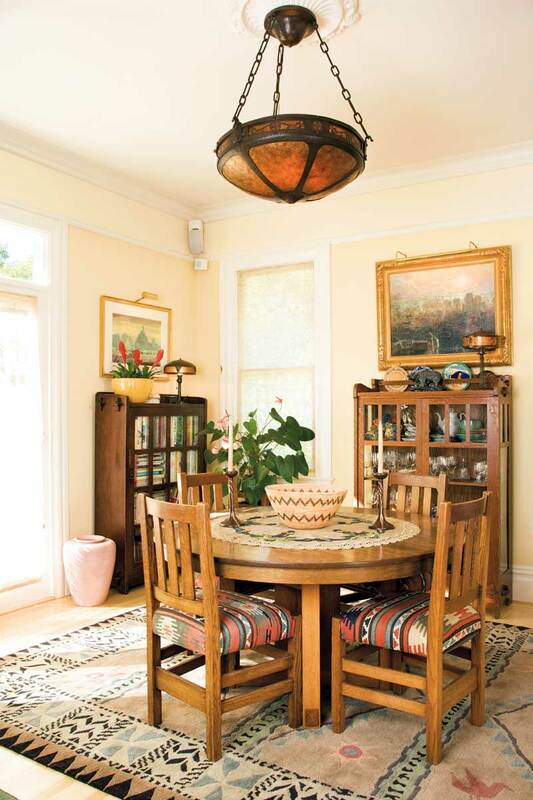 In a 1906 California bungalow, the dining room is furnished with antique oak pieces and plein-air paintings, Native American baskets, and a bowl chandelier by Michael Adams of Aurora Studios. Many people are uncomfortable buying furniture—and not only because of the cost. Here is some basic advice: (1) Embrace what you love and can live with long-term. (2) Buy good furniture, even if it means living with folding chairs and patio wicker while you save to buy one high-quality piece a year. Later on, you can move the wicker from the living room to the porch. (3) Take cues from the age and style of the house. 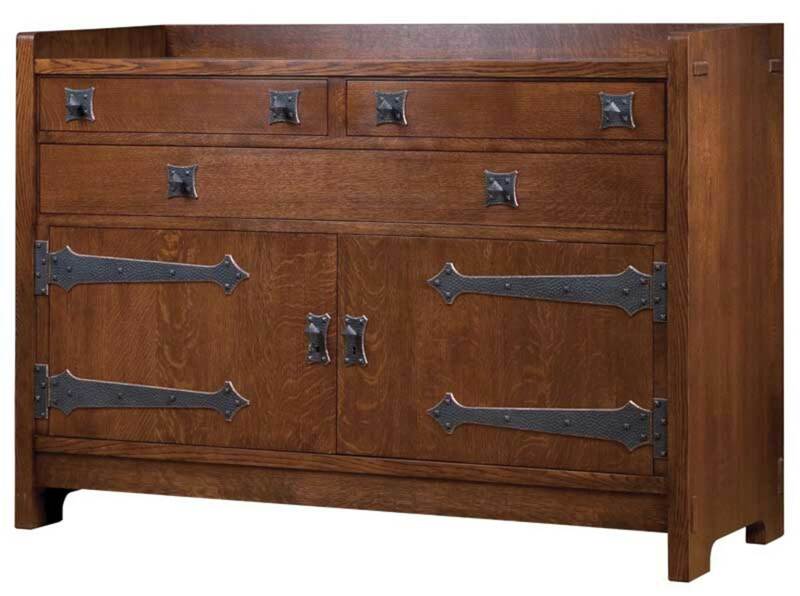 The oak sideboard reproduces a Gustav Stickley design of 1902; from today’s Stickley. You may not want to live in a museum, but furnishing in sync with the date and design vocabulary of the house is a shortcut to non-faddish rooms that “look right.” Your house is giving you clues, so you might as well start there. An original Gustav Stickley Morris chair in fumed oak at Craftsman Farms, Stickley’s home in New Jersey. A period classic—a Morris chair, a spindle daybed—can anchor a room. 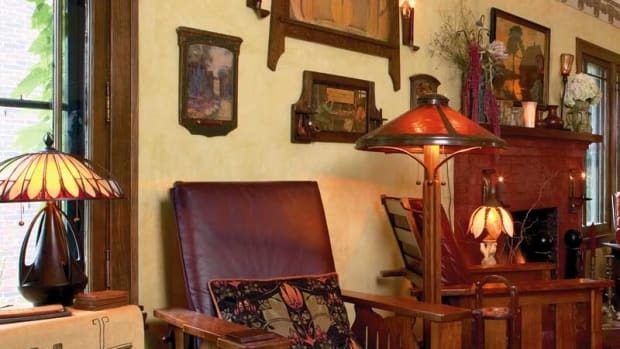 Do mix in antiques to avoid the boring, matched-set look of some contemporary interiors. Antiques add history and personality to a room, but many times they are not practical—as with chairs that are used every day, for example. 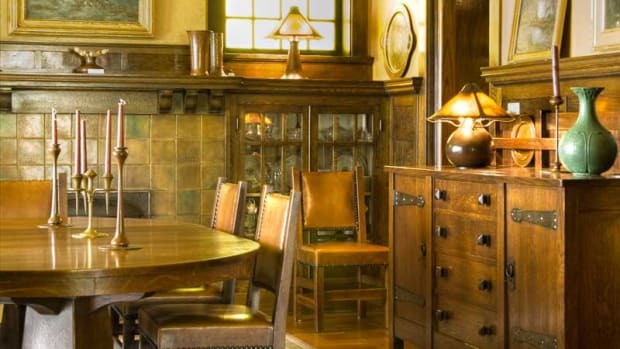 “The majority of collectors we know are happy buying new objects to put alongside their antiques,” says Aminy Audi, president and owner of Stickley, a company of the original Craftsman period, which the Audis revived. Reproductions are great for hardworking rooms and when you need a full set. Seek out specialty suppliers and artisans who do reproduction or adapted styles. A Rohlfs-inspired tabouret holds a jardinière with a lily-of-the-valley motif; both represent new work available at Nest & Co.
Arts & Crafts-period homes are forgiving of an eclectic approach. Right from the beginning, the house probably mixed Craftsman and Colonial Revival motifs in woodwork, and certainly in the furniture. Sturdy colonial-era classics (like benches and Windsor chairs), rustic furnishings, wicker, iron, and more typical Arts & Crafts styles work together. 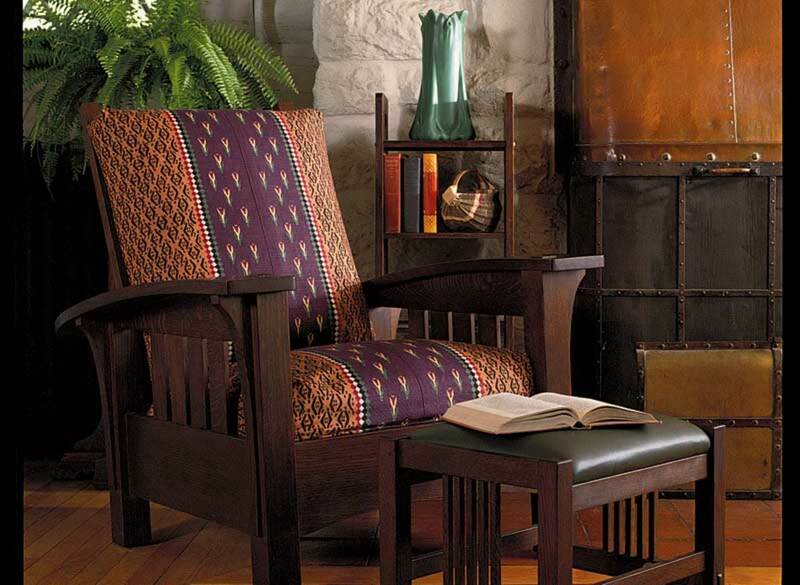 Rectilinear Stickley-type furniture also marries well with Modern furniture. To get an integrated, usable room at reasonable cost, many people mix good-enough pieces with reissues of classic designs, future heirlooms, and antiques. 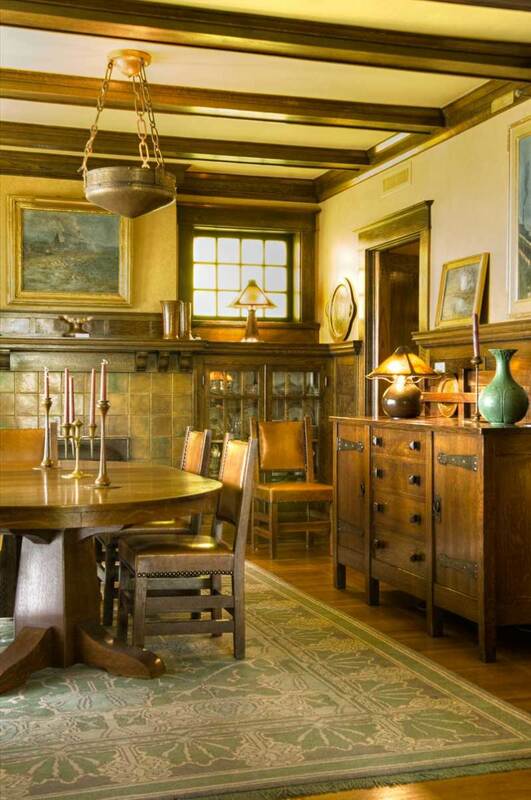 In a 1915 Prairie-influenced Foursquare, the home of an avid collector, antiques include the sideboard, dining table, and chairs, all early pieces by Stickley. The reproduction rug is a Voysey design. For years, a growing number of artisans and manufacturers has been offering period-inspired furniture, as well as such decorative pieces as pottery and art prints. The work includes documentary reproductions (near copies of original pieces). 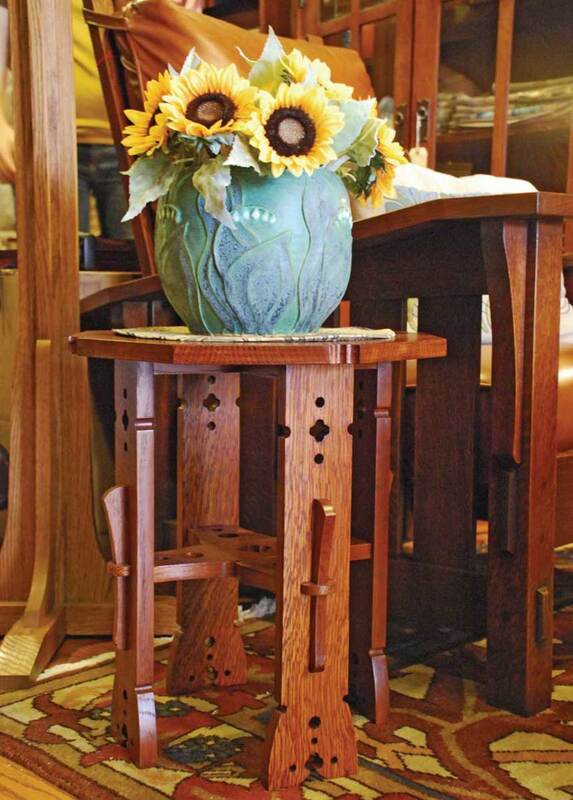 Many more artisans create interpretive new designs, with allusions to previous Arts & Crafts styles and also such earlier American furniture as that produced by the Shakers. As was true 100 years ago, there are many languages of Arts & Crafts. British work (by Godwin, Voysey, and Mackintosh) is often more delicate, and later work leans toward Art Nouveau. 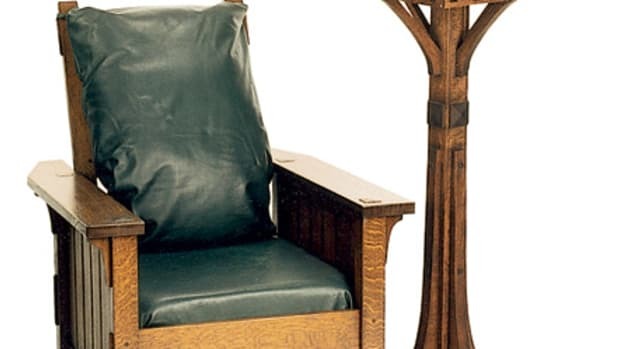 American Craftsman pieces by Stickley and the Roycrofters are sturdy and rectilinear; Wright’s Prairie School designs are proto-Modern, like the reproduction Barrel chair below; Greene and Greene’s are strongly Japanesque. German, Austrian, Russian, and Swedish influence may be present. This diversity continues.